CLICK HERE TO PURCHASE BUNDLES! 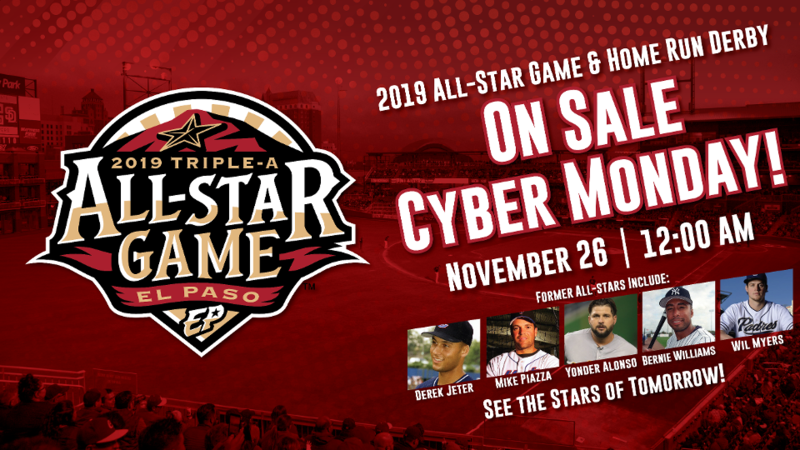 EL PASO - November 23, 2018 - Ticket bundles for the 2019 Triple-A Baseball All-Star Game and Home Run Derby will go on sale to the general public online beginning on Cyber Monday, November 26th at 12 a.m. Minor League Baseball's premier event will take place from July 8-10, 2019 and includes the popular Home Run Derby and concludes in the nationally televised All-Star Game. For those patrons who would like to purchase in person, ticket bundles will be available for purchase at the Durango Box Office at Southwest University Park beginning on November 26th from 9 a.m. to 5 p.m. Started in 1988, the 32nd edition of the game will showcase the best players of Triple-A Baseball's Pacific Coast (PCL) and International Leagues. The International League has bested the PCL with a 12-9 record with the PCL the winners in 2017 & 2018. All-Star Game alumni include Derek Jeter, Chipper Jones, Pedro Martinez and Mike Piazza to name a few. The Chihuahuas 2019 All-Star Season is slated to begin on Thursday, April 4th at 7:05 p.m. versus Las Vegas (Oakland A's). For more information on the 2019 Triple-A Baseball All-Star Game & Home Run Derby tickets or to speak to an Account Executive, call (915) 533-BASE. WHEN: Cyber Monday, November 26, 2018 at 12 a.m. online and in person at the Durango Box Office from 9 a.m.-5 p.m. Monday through Friday. WHERE: www.epchihuahuas.com and the Durango Box Office at Southwest University Park. Note: A $5.00 convenience fee per ticket bundle will be applied to online purchases.